…was downloading the Little Miss Spider Tea Party app for my iPad. Haha, so cute, it's a puzzle she's doing so it's educational right? And I am not completely coveting your Ipad… I'm not I'm not I'm not. I took my 4yo to the Apple store last week and she found a Super Why game on one of the iPads and said "I want this mommy". Me too little one, me too. That iPad is the reason why there is no iPhone 4 in my immediate future. I caved and downloaded it after five days at the hotel with not enough toys. It's actually a cool app. I have purposely not told her about Super Why for the iPad, because then I'd never get a turn! She's so cute! 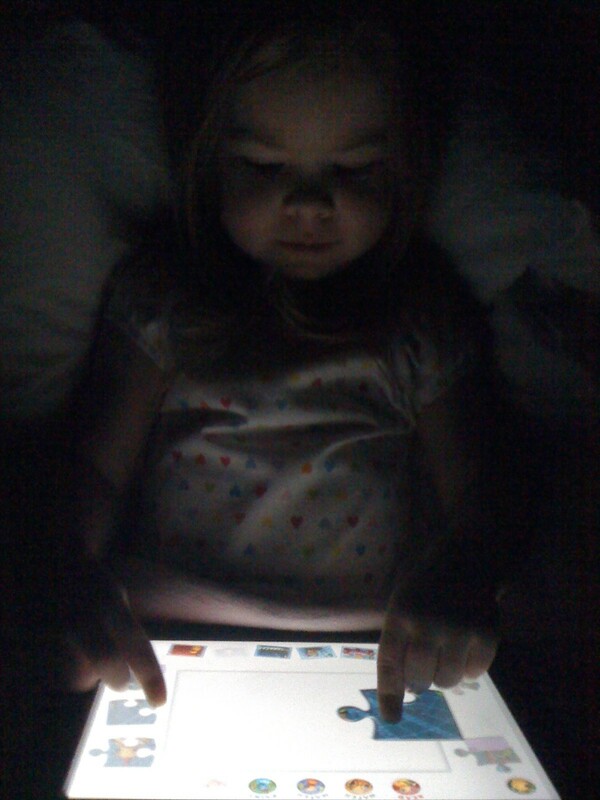 I'd have a hard time deciding – happy kid, or use my iPad myself? And yet again….envious of a four-year-old. I'm glad I'm not the only one to have an iPad stolen by a toddler. If my daughter wanted it, she should have sold HER soul to the devil (my wife). I think that before long, I'll hear you telling stories about how much Carter loves yours! I've never seen such a great motivational tool, though. Wanna use the iPad? Okay, eat your chicken. Wanna play on the iPad? Okay, pick up your toys. I held out, I really did. Until I was trapped in a hotel room with a VERY bored three-year-old for DAYS!